Moscow – Another day and another medal for Canada at the 2013 International Association of Athletics Federations (IAAF) World Championship in Moscow, Russia. Dylan Armstrong of Kamloops, B.C., won bronze in the shot put with a seasonal best of 21.34-metres. 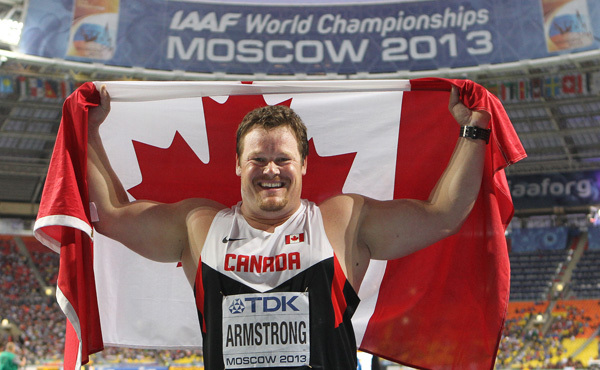 Armstrong’s medal is Canada’s fourth in Moscow, tying Canada’s best all-time performance at the IAAF World Championships. Dylan on his medal tying Canada’s best ever showing at the World Championships, “It’s another medal for Canada, it shows that when you have the right coaches in place, the right support and the funding behind it that it’s going to payoff. You have to invest in sport, results don’t come for free.” This is Dylan’s third World Championship medal after winning indoor bronze in 2010 and outdoor silver in 2011.